Experience the original taste of smooth, pure Belgian chocolate. Enjoy our milk chocolate, dark chocolate and even a worldwide favorite white chocolate, combined with almonds, mint, coconut or raspberry or filled with praline. Recent studies indicate that the consumption of dark chocolate has significant health benefits. 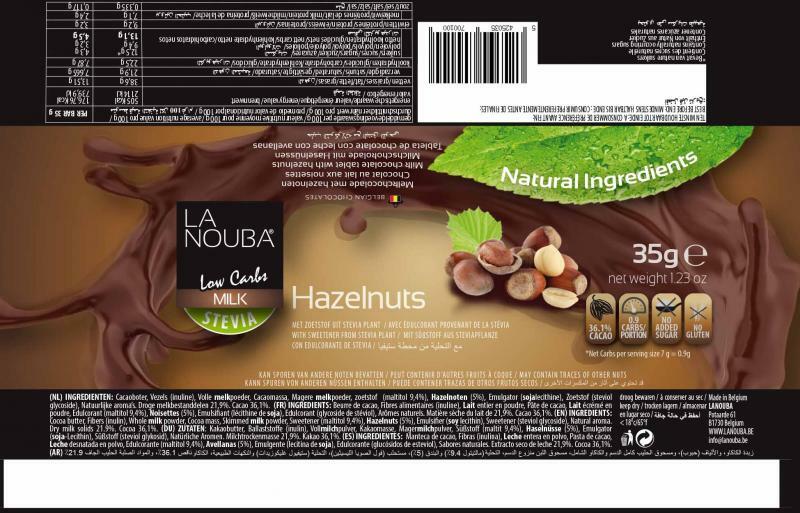 LaNouba products are made in Belgium, the home of the finest chocolate makers in the world. Their taste is identical to regular chocolate. Each bar is packed in a way to ensure that the quality and the full chocolate flavor are never lost. LaNouba bars are more than just LOW CARBOHYDRATE chocolate bars, they are also low in fat. Truly a unique product with an unbelievable taste! It’s a Belgian chocolate bar filled with an orange, coconut or lemon cream. Each bar contains only 72 calories per 18 g, 1.4 carbs and 30% less fat than a regular bar. Experience the magic of LaNouba. The smooth and creamy taste makes you forget that in addition to it being a low carb chocolate bar, it is also low in fat. Added magnesium and calcium give you additional health benefits. Specially formulated for chocolate lovers who watch their carb and fat intake but still want to enjoy the taste of full chocolate.